This weekend I had the chance to taste through some fascinating, under-the-radar releases from Cayuse, vigneron Christophe Baron’s biodynamic Walla Walla winery. The two pictured here, released under the No Girls label, are a collaboration between Baron and his GM, Trevor Dorland. As Baron explained it to me, this is a stand-alone project, with its own unique vineyard, La Paciencia (patience). The vineyard was planted between 2003 and 2005, adjacent to the Armada vineyard, and the first couple of vintages of wine were declassified. In 2008 a small amount was offered for sale. According to Baron, it sold out in a half hour, and there is now a long waiting list. “We got slammed! But I’m getting used to creating monsters,” he noted with a laugh. The name (and label design) are taken from a bit of graffiti on the wall of an empty building in downtown Walla Walla. You can see a picture here. At one time a haven for hookers, the building’s No Girls sign remains as a mysterious clue to a past shrouded in secrecy. Who painted it? When? Was it supposed to be a joke? Whatever the answers to those questions, the wines are perfectly serious. Given the young vines, they are more fruit-forward and less imbued with the saline funkiness of the other Cayuse wines. Case production is supposed to grow slightly from just over 300 to a total of 500 cases in the next couple of years. That is all there will be. I honestly have no clue where these wines can be obtained, but since I was offered the opportunity to taste the 2009 releases – a grenache and a syrah – I share with readers of this blog my notes below. 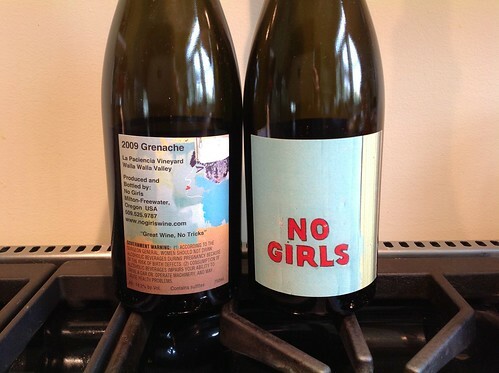 Floral and focused, with supple, dark fruit flavors, the No Girls Grenache has an almost Burgundian style, though of course it has more color and density than Pinot Noir. From young vines, it was aged in completely neutral barrels, and puts the emphasis squarely on fruit rather than the earthy, umami flavors of the other Cayuse Grenache. The No Girls Syrah, from the new La Paciencia vineyard, has a superb fruit core tasting deeply of cherry compote. A dash of minerality, some dusty tannins, good grip and a generous layer of bacon fat gives depth, while the mouthfeel remains precise, fresh and focused. As much fun as those two wines were, the best was yet to come. Two unreleased wines, extremely limited bottlings done exclusively in magnum, were also offered for tasting. They were unlabeled, as the label design is a work in progress But the name – Wallah Wallah, based on an old spelling – has been determined. Calling them a “coup de coeur” – essentially, a blow to the heart – Baron poured them with considerable pride. It would be fair to call them the first (and to my knowledge only) Cayuse reserves. Neither the No Girls wines nor the Wallah Wallah wines will be reviewed in print, so I have decided to publish full reviews and scores here. The scores are just to place them in the context of the rest of the Cayuse lineup, which will be reviewed in a future issue of Wine Enthusiast. No prices or distribution details have been decided upon. Just 181 magnums of each wine were made. Like the 2009 GOK and 2009 No Girls, this is an excellent vintage for Cayuse Grenache. The Wallah Wallah offers sensational purity. The intensely deep and penetrating fruit and rock flavors override all else, making this a different style from the other bottlings. It is sourced from a special block in the Armada vineyard, where, I am told, the cobblestones turn to pebbles. Sourced from the Cailloux vineyard, this one-of-a-kind reserve offers mind-boggling concentration and length. Co-fermented with 8% Viognier, it shows gorgeous aromatics with a floral/body powder elegance. Baking spices, saline notes, full-on umami richness and dense, mixed fruits, combine in a palate that rolls on endlessly, an ocean of rich, fecund flavors. A spectacular effort, still quite youthful, with perhaps decades of life ahead. I would suspect the only way to get the No Girls wines is through their mailing list. I have been on the Cayuse wait list for 4 years and as a result I was sent an email offer aksing if I wanted to be on the No Girls mailing list. I replied to the email within 5 minutes accepting the offer but was told later that I didn't make it but was placed on the wait list which was surprising and a bummer. My guess is they had some sort of ranking to determine who made the cut. Hopefully, I will make it to the top of one of these lists soon. Bueno! This filled out the story of a wine I've spent a bit of time with lately. Only to be photographed. I've not tasted the innards. Tonight I came across a source for a small count of No Girls, along with a few other Cayuse treasures, at Harbor Square Wine Shop & Tasting Room on Bainbridge Island. It's sort of like knowing the guy working the door. No website. One will have to ride the boat.